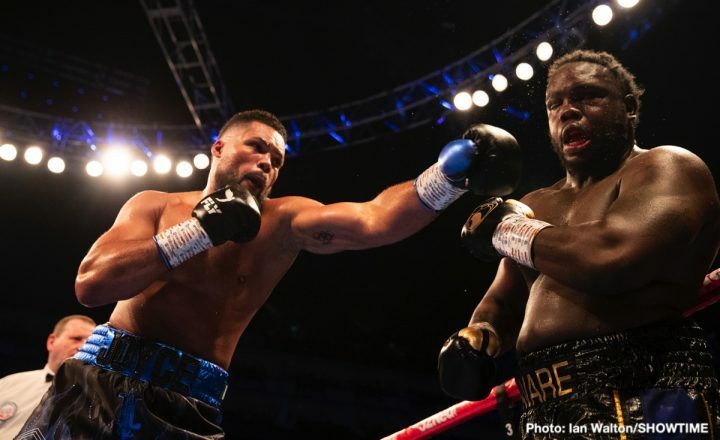 By Tim Royner: Promoter Frank Warren reportedly has the tentative schedule for heavyweight Daniel Dubois (10-0, 9 KOs) already mapped out for the remainder of 2019, and 2016 Olympic silver medalist Joe Joyce (8-0, 8 KOs) is pegged as the next opponent for him to fight after he faced Richard Lartey (14-1, 11 KOs) on April 27 at the Wembley Arena in London, England. It would take a great deal of courage by Dubois to fight Joyce in his next fight after the Lartey fight this month, which figures to be a mismatch. Joyce is someone that would give heavyweight champions Deontay Wilder and Anthony Joshua a lot of problems at this point. You couldn’t rule out a victory for Joyce against either of those guys with the way he grinds down his opponents with steady pressure, and heavy shots to the midsection and head. It’s very difficult to imagine Dubois’ promoter actually making the fight in 2019, especially not before he matches him against Nathan Gorman, who he promotes. Joyce, 6’6″, looks more advanced than Dubois, and he’s coming off of a sixth round knockout victory over former WBC heavyweight champion Bermane Stiverne on February 23. Joyce looked good in battering Stiverne to earn a sixth round stoppage. Before that, Joyce destroyed Joe Hanks and Iago Kiladze. It obviously brings Dubois some badly needed press to be talked about by the news sites around the boxing world in being mentioned as possibly facing Joyce in 2019, but it seems so unlikely to happen. You can argue that they might as well be talking up a fight between Dubois and Deontay Wilder or Anthony Joshua. Having Gorman as Dubois’ opponent after the Joyce fight looks bad, because that would be a tough fight for him to take after being beaten. Instead of a hard puncher on the schedule for after Dubois faces Joyce and likely loses, they should have someone like Tom Little. That would be a good confidence booster for Dubois to get back on the winning track. The British Boxing Board of Control recently ordered Joyce and Dubois to fight for their vacant British heavyweight title, and both of them seem to be highly interested in the fight. This is the title Hughie Fury vacated recently. “There is no way around these fighters, I have to face him and I have to beat him,” Dubois said about fighting Joyce for the British title. “Me against Joe, if that fight can be made, I am definitely up for it. We did a lot of rounds, maybe 40-60, when I mixed it with all the guys up there,” Dubois said in talking about having sparred Joyce in the past. Lartey and Gorman are considered to be mismatches for the 6’5″ Dubois. The unbeaten 22-year-old Gorman (16-0, 11 KOs) is a decent fight for Dubois, but not a great one. Gormon looked utterly pedestrian in recently beating journeyman Kevin Johnson (34-13-1, 18 KOs) by a 10 round points decision on March 23. Dubois looks like he’ll have no problems against him. Joyce, 33, is kind of up there in age to be fighting for the British heavyweight title. Joyce is already ranked #15 by the World Boxing Council in their top 15 world rankings. It would seem that Joyce would be better off focusing on going after top contenders in the world rankings rather than taking on 21-year-old domestic level fighter in Dubois at this stage. The question is will a victory for Joyce give him a higher ranking with the WBC and the other sanctioning bodies or will it tie him down to making pointless defenses of the British belt. Joyce doesn’t need to be trapped fighting lower level heavyweights for the remainder of his career if he wins the British title. Dubois has recent wins over former heavyweight world title challenger Razvan Cojanu, Kevin Johnson and Tom Little. Dubois turned pro two years ago in 2017, and he’s slowly being moved upwards against steadily better opposition. Lartey is arguably a backwards move from Dubois’ last opponent Cojanu. That’s someone that Cojanu would likely beat. If nothing else, it would be a good experience for Dubois to fight Joyce right now. Even if Dubois loses, which seems what would likely be the case, he would improve from the fight if it didn’t crush him mentally. You never know how a fighter is going to react to a disappointing loss. Dubois could either take it as a learning experience, the way that Saul Canelo Alvarez accepted his defeat to Floyd Mayweather Jr. in 2013, or could hurt him mentally and cause him to retire or fight without any passion for the remainder of his career. Jeff Lacy’s career was never the same after he lost to Joe Calzaghe. Could this happen to Dubois? If Dubois is moved slowly enough, he might become a good heavyweight in the future. Right now it would be a bad idea for him to be matched against anyone with a shred of talent. Joyce has a lot of talent, and the kind of high pressure style of fighting that would give Dubois fits. Dubois looked tired at times in his fight against Kevin Johnson recently, and all he was doing was flicking a jab in his face. If Dubois were to mix it up with a heavyweight like Joyce, who would be hitting him constantly to the body and head, and not letting him get his badly needed rest breaks, it could end badly for the young Dubois. Any one of these fringe contenders would be a fine choice for Dubois to fight after he deals with Richard Lartey on April 27. Michael Hunter might be too much of a test for Dubois though. That’s a fight that Dubois could lose. But as far as the rest of the names, Dubois would likely have little problems beating all of them as long as he doesn’t get caught with something silly.